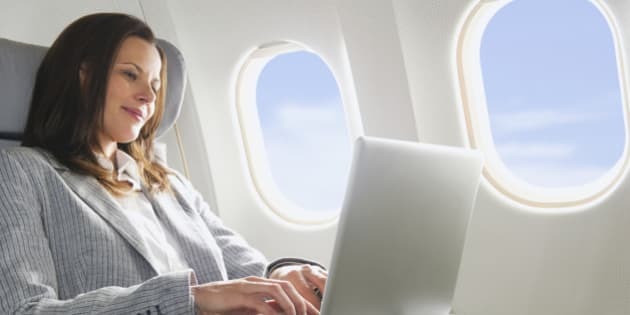 As a travel writer, I've flown many, many miles, and scuttled through many, many airports and the following simple tips and tricks have made all of my flights just a little bit more enjoyable. If you're new to flying, I hope these help. 1)	Check in on-line before you fly. You will have a reservation code on your ticket, which you will need when you go to the airline's website. You will most likely be able to check in 24 hours in advance of the flight; experienced fliers count down the minutes to that 24 hours to ensure they can nab a good seat. Good seats include exit aisles and front rows. Many airlines now charge an extra fee for these seats, but the fees are generally quite low, and well worth the extra legroom. Something to note -- children cannot fly in an exit row (have to technically be big enough to open the door in case of an emergency), and there are no seat belt extenders allowed in these rows either. 2)	Check the terminal that your flight is leaving from...and returning to. If you've booked outbound and inbound with two different airlines, you might want to check where you should park your car, and what the shuttle service between terminals is like. 4)	Make sure you get your bag tag sticker attached to your boarding pass or other paper; double check to make sure they have checked it through to the correct destination, particularly if you have a connection. Don't throw away the bag tag until you have your suitcase in your hand, as it is really the only way the airline has of tracing your bag. 5)	Plan to arrive at the airport at the airline's recommended time prior to departure...and then add at least half an hour. Traffic, long lines, confusion can all eat quickly away at your estimated time to process. If you're through quickly, find a coffee and enjoy some free Wi-Fi (many airports have this) or read a book. Relax, don't stress. 6)	Go to your gate and make sure your flight is a) still flying out of that gate and b) is on time. I've known quite a few folks to be sitting at the wrong gate (and they do frequently change), having to sprint down the length of the airport to make their flight. 7)	Unless your meals are prepaid on your flight (business class, special deal), you'll probably want to eat at the airport or bring your food on board. Airline food tends to be more expensive and less tasty than what you can find at the airport. Another reason to arrive early! 8)	Find the closest washroom to your gate and go there a few minutes before departure, even if you don't "need it". Empty the tank and avoid having to squish yourself inside a tiny airplane washroom...after waiting in line for it. On the flipside, Every time you're offered water on the flight, or it is an option, take it. Flights are extremely dehydrating and the water you take on will help you to avoid headaches and dry throat. 9)	Board the plane according to row number, but unless you're rushing to store an overhead bag, don't hasten to get to the front of the line. Your seat is assigned. If you have children, don't pre-board as they suggest, wait to board last; they're better running around the airport than they are confined to a seat. 10)	Don't put anything in the seat pocket in front of you. Many, many tablets, books, phones, and precious stuffed animals (there is a bunny flying around the friendly skies with my daughter's name on it) have been lost there. Keep items in your bag, on your lap, or on the seat beside you.